Kimberly Adriaansen - West Seneca, NY - Kimberly is the Program Coordinator for Tifft Nature Preserve and life-long advocate of infusing science education with art. Drawing upon her science and art background (B.S. Biological Sciences/ Studio Art and M.S. Environmental Interpretation) and love of the outdoors, she leads nature journaling workshops for all ages in pursuit of bringing people intimately closer to the natural environment vital to us all. Kimberly enjoys being a freelance artist in her spare time and works primarily with graphite, pen and ink, watercolors, and Conte' as well as pressed botanicals. Susan Avery - Great Valley, NY - Not exactly raised by wolves, but trained in nature and her ways through years of scouting and the ever restless need to explore the outdoors. Susan is a self-­trained naturalist, licensed New York State Outdoor Guide, certified Florida Master Naturalist, and National Park Services volunteer naturalist/docent. She is always looking for opportunities to share those marvelous moments in nature with fellow explorers of all ages. Her areas of interest are trees, old growth forests, spring ephemeral flowers, local historic geology, and marine and freshwater invertebrates. 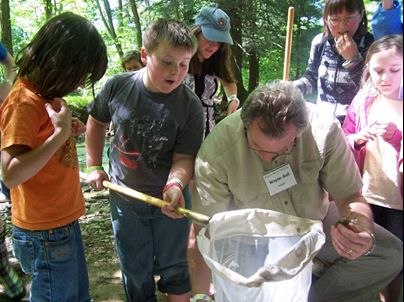 Rick Bacher – Snyder, NY – Rick is a full-time English teacher and avid outdoor educator. Rick volunteers time as a Junior Audubon leader at Buffalo Audubon, Program leader and photographer at Tifft Nature Preserve, Raptor ID workshop leader for the Buffalo Ornithological Society, Hawk counter for the Hawk Migration Association of North America, and has spent time banding both passerines and raptors. 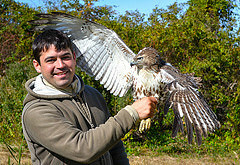 Rick specializes in the identification of raptors, but has a general passion and knowledge for all birds and life. Rick is also a wildlife photographer and prolific birder. You can follow Rick's photography at http://instagram.com/rickbee or read his birding blog at http://rickbee.weebly.com/adventure-blog.html. Tim Baird - Salamanca, NY - Tim is a retired science teacher with a Master's Degree in biology. He has led programs for the Allegany Nature Pilgrimage and other groups for many years. He is interested in all aspects of natural history. He has a particular fondness for birds. Nature photography is also a strong interest. He lives in Salamanca, giving him easy access to Allegany State Park and providing him with an intimate knowledge of the park and its habitats. Mark Baker – Olean, NY – Mark is known by many as The Bird Guy because of his work at Eagle Dream Rehabilitation Center, Inc. Mark works to heal and release injured raptors and vultures. Some that cannot be healed are used for education programs. Mark Carra – North Java, NY – Mark started as a wildlife educator in 1989 and has spoken to more than 500,000 people since then. He currently serves as the naturalist in residence for the Beaver Meadow Audubon Center. Mark has also worked as a representative and presenter for Animal Planet, National Geographic Channel, and public television and has handled animals for many of their celebrities. His passion for learning and obsession to communicate what he has learned has kept him going all these years and loving the entire journey. Kathleen Contrino - Akron, NY - Dr. Kathleen Contrino, a graduate of University at Buffalo with both a J.D and Phd in Sociology, is a professor of criminal justice at Canisius College. Dr. Contrino practices family law in New York and represents children and adults in a local Family Treatment Court. Dr. Contrino participates in the Cornell Cooperative FeederWatch program/Habitat Network, volunteers at Iroquois National Wildlife Refuge and the Buffalo Audubon Society leading tours as well as lectures on native plants in residential communities. opportunities to study and enjoy wildlife all year round. Angela Cousins - Great Valley, NY - Angela is a nature enthusiast and one-time professional naturalist. Her "happy places" are often found in the woods and wild places of NYS and beyond. This is her first year as a presenter at the Pilgrimage and she is looking forward to meeting all of the like-minded participants and inspiring attendees to a greater love and appreciation of the natural world. Frank Crombe - Scottsville, NY - Frank’s extensive knowledge of trees, shrubs, wildflowers, etc. comes from his hobby interest working outdoors and gardening, growing native plants and membership in various conservation organizations. Frank has a Masters degree in Education. Steven Daniel - Pittsford, NY - Steven has spent the better part of a lifetime studying natural history and teaching others, formally and informally. He took an early retirement from teaching to develop Nature Discoveries, an ecotour company which he co-founded, and for whom he has led some 140 trips to some of the world’s finest natural areas. He was a founder and first president of the Rochester Area Mycological Association. He developed biotic inventories and master plans for The Nature Conservancy’s Mashomack and Great Gully preserves, and the Genesee Country Museum’s Nature Center. He teaches Field Natural History (a class he developed nearly 40 years ago) at Monroe Community College. In recent years he has grown quite passionate about dragonflies, butterflies and moths, and sedges. Now semi-retired, he spends much of his time exploring the great ecological treasures of New York’s North Country. He is a board member of the New York Flora Association, co-curator of the Rochester Academy of Science Herbarium, and has served on the executive council of Burroughs Audubon Nature Club. He has an M.S. in science and environmental education from Cornell University. Lisa Danko – Erie, PA – Lisa has a Biology degree from Buffalo State College and an Entomology degree from Pennsylvania State University. She has attended the Pilgrimage and sat on the board for over 30 years, having led a large variety of field trips. She is truly an enthusiastic naturalist! 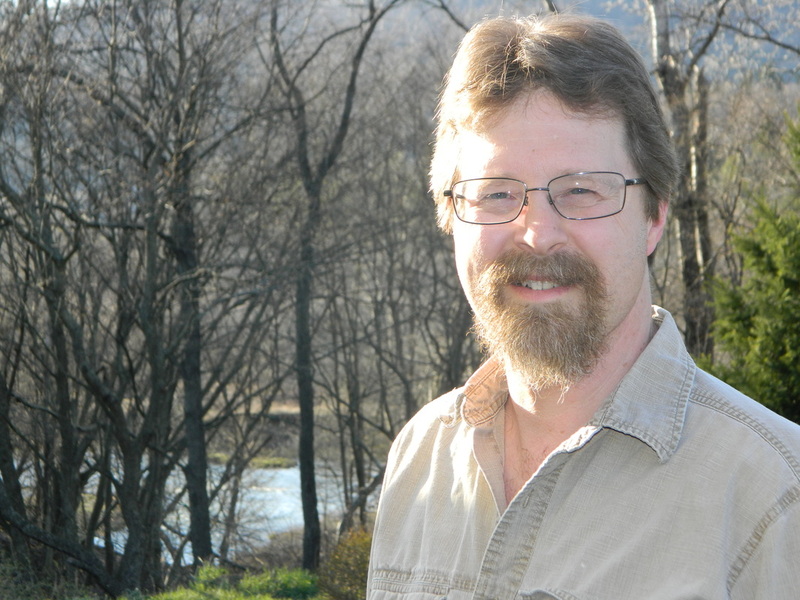 Brian Deck – Java Center, NY – Brian is a self taught naturalist with experience leading group and individual tours. These tours focus on generalized, easy to understand, experiential learning and interpretive talks on: geology, plants, hydrology, animal life and behavior, wilderness survival skills, edible plants, natural resource ecology, and general history. He has previously led tours for ANP, Buffalo Audubon, Tifft Nature Preserve, worked at a wilderness camp in NC, been a white water guide, as well as worked as an interpretive canoe guide for an Outdoor outfitter in Big Bend National Park, TX. Personal trip experience includes bush plane kayaking, backpacking the 100-mile wilderness on the Appalachian trail, numerous hikes and/or canoe-kayak trips in Algonquin, the Adirondacks, and multiple state and national parks, and a recent trip to Hawaii, Australia and New Zealand. 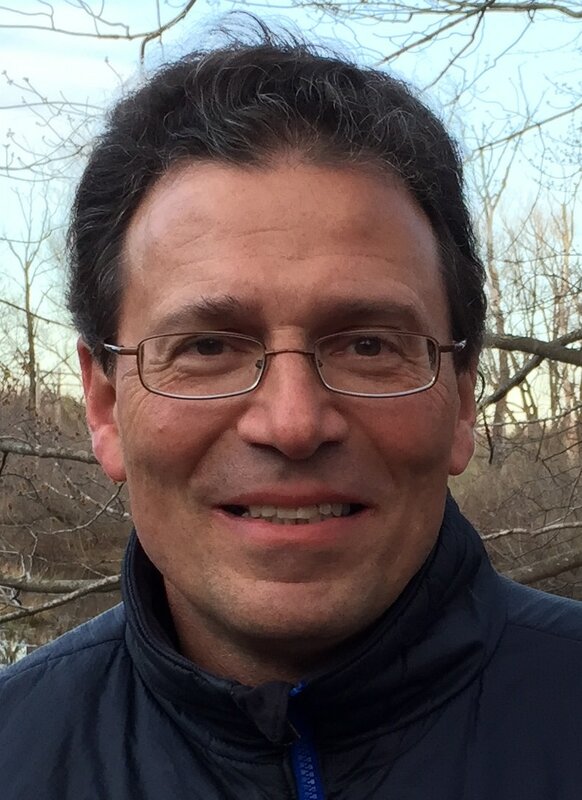 Tony DiGioia – Tony is a former corporate educator and is actively involved in local nature programs. Lois Donovan – East Aurora, NY – Lois has been a volunteer at Beaver Meadow Audubon Center for close to 50 years! She is the driving force behind the very successful Enchanted Forest event that takes place annually at Beaver Meadow--from costumes to schedules, she does it all! Happily married to Terry Donovan for the past 52 years, they both have been enjoying going to the Pilgrimage for many years. In her spare time, she enjoys sewing, gardening and baking. Christopher Duckett - Jamestown, NY - Starting at a young age Chris has always been fascinated with the natural world around him. From catching crayfish and frogs at local park streams, to flipping logs in the woods looking for insects and salamanders, and everything in between. For the past ten years he has been taking in unwanted exotic animals and placing some in new homes while using others as part of my educational crew. Chris also works with and assists other local animal rescue groups, wildlife rehabbers and leads nature walks for families in the spring and summer at local parks. Laura Dustin – Laura has done graduate work on the vascular plants of Cattaraugus County. She has been a Science Educator for 30 years, including the environmental sciences. Becky Efigenio - Macedon, NY - Becky has been a lover of nature since a young age. Her journey started in Girl Scouts, then working with an organic gardener and learning about soil science, joining AmeriCorps to cut trail and do preservation in Nevada and California, and most recently completing a course of study in Herbalism at Heartstone Center for Earth Essentials. She is continuing her passion for plant medicine in a four-year Clinical Herbalist program. ReAnn Ehman - Great Valley, NY - ReAnn is an elementary teacher with over 10 years of experience teaching children. She loves learning about nature & exploring the outdoors. This is her first year as a presenter at the Pilgrimage and she is looking forward to spending time learning from others. Marie Erck - Lockport, NY - Marie has always enjoyed being outside in nature. Trees, especially, were her favorite. There were so many different kinds! Over time she eventually learned how to identify them--both through training as a Master Gardener and from studies in horticulture. Alyson Dalton - Jamestown, NY - Alyson was born in Australia she has a great love for nature and the great outdoors, as a family we love to spend as much time outdoors just walking through the woods, playing in the creek, or going to our local Audubon. Alyson is in the 5th grade at southwestern Elementary school, in Jamestown NY and this is her 7th year at the pilgrimage in which she has learned so much from others. Alyson wants all kids to love the nature and earth as much as she does. Kristen DiGioia – Pheonixville, PA – Kristen has worked for 4 years as the Naturalist/Camp Counselor at the Great Valley Nature Center in Charlestown, Pennsylvania. Se has a life long interest in environmental issues and education. Angie Driscoll - West Seneca, NY - Angie has her bachelor’s degree in Biology with a minor in Environmental Studies from SUNY Geneseo, and got her Masters in Botany at Miami University of Ohio, conducting spatial studies on invasive plants for her thesis. While at Miami, she taught a field botany course. After grad school, she worked at WNY Partnership for Regional Invasive Species Management, primarily conducting surveys and managing invasive plants. Angie also taught a Great Lakes Education Program through Cradle Beach in various Buffalo schools. She currently work as a Wetland Technician at the NYS Department of Environmental Conservation, focusing on wetland permit compliance and conducting wetland delineations. Wayne Gall - Lancaster, NY - Wayne earned his MS in Entomology at the University of Wisconsin-Madison and PhD in Zoology at the University of Toronto. He served on the staff of the Buffalo Museum of Science from 1983-2001, first as Administrator-Naturalist of Tifft Nature Preserve, then as Curator of Entomology. Wayne was Western Regional Entomologist for the NYS Department of Health from 2001-2016. Since 2016 he has been Entomologist (Identifier) for the US Department of Agriculture at the Peace Bridge in Buffalo. The 2018 ANP will mark Wayne's 35th year as a program leader. Frank Gardner - Bedford, MA - Frank has been an amateur birder for over 35 years. He serves as Christmas Bird Count coordinator and contributes to breeding bird atlas projects. He has been a field trip leader at ANP for 30 years. Nan Hoffman - Grand Island, NY - Nan is a singer, musician, performer, recording artist, and workshop presenter. She has been sharing music with people of all ages for more than thirty years throughout the United States and parts of Canada. She has appeared in coffeehouses and festivals, schools and libraries, parks and camps, churches and community centers, hospitals and nursing homes and continues to keep a busy schedule of performances. Nan sings in a clear voice and accompanies herself on guitar, autoharp, and other instruments. Her repertoire encompasses a wide range of folk songs and ballads, both contemporary and traditional, including topical, spiritual, and humorous songs. Her presentations are fun and informative, and much of her material invites audience participation. Nan has often been heard on public radio and television and has published eight collections of recorded music. A THOUSAND CRANES, RISE LIKE A STAR, and ALONG THE ROAD are albums which focus on peace, ecological concerns, and human potential. (almost) TWO MUCH! is a CD of songs with addictive choruses for children of all ages. CELEBRATIONS OF THE HEART features music for the Christmas season and other festive times. Nancy Jager - Dunkirk, NY - Nancy is a nature enthusiast who enjoys nature photography. She has taken Jamestown Community College courses on plants and insect sketching with Mark Baldwin. M.S. Education State University of New York at Fredonia. NYS Certified teacher, grades K-12. Traveled and lived in South America. Bilingual: English/Spanish. Tom Kerr – Tonawanda, NY - Tom is a Teacher/Naturalist with the Buffalo Audubon Society. He is a graduate of SUNY ESF with a BA in natural history and interpretation. Look for Tom's name next to birding and kids' nature programs. Twan Leenders - Jamestown, NY - Twan is a biologist from The Netherlands, specializing in animal ecology and conservation management. For more than twenty years he has carried out research on birds, mammals and plants in various places on the planet but Twan is particularly interested in amphibians, reptiles and tropical rainforest ecology. As a former researcher at Yale University's Peabody Museum he has participated in many international expeditions that helped gather data to better understand and protect biologically important areas and the species and habitats found there. 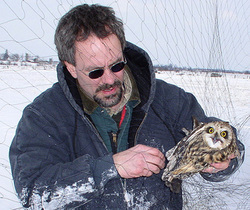 Before coming to western NY, Twan was an Assistant Professor of Biology at Sacred Heart University in Fairfield, CT, and went back into the trenches of conservation research and outreach while leading the Science and Conservation Office of the Connecticut Audubon Society. As President of the Roger Tory Peterson Institute of Natural History, he now applies his experience to our region and develops new conservation research and education initiatives that aim to spark increased interest in the area’s unique natural history while providing economic incentives to promote good environmental stewardship. Twan's research on endangered amphibian populations in Costa Rica and Panama continues today and he returns to both countries regularly, with or without student researchers in tow, to continue documenting the fascinating dynamics of tropical rainforests. Following in the footsteps of Roger Tory Peterson, Twan has written and illustrated three books on Costa Rican wildlife, most recently ‘Amphibians of Costa Rica – a Field Guide(Cornell University Press, 2016). As an avid photographer and wildlife artist, Twan's images have appeared in many publications by the National Geographic Society, GEO, Dorling Kindersley an numerous other magazines and books; he is also a photographer for the 'Meet your Neigbours' Global Biodiversity Project. His field guide illustrations are currently in use for educational purposes and displays at the Royal Ontario Museum, Yale Peabody Museum of Natural History, the California Academy of Sciences and Smithsonian’s new ‘BioMuseo’ in Panama City, Panama. Garner Light - Gasport, NY - Garner is a member of the Buffalo Audubon Society and former program coordinator of the Iroquois Observations! Nature Programs at Iroquois National Wildlife Refuge. He is also the compiler for Wilson-Lake Plains Christmas Bird Count and coordinator for the Clarence Bluebird Trail. Judy Light - Gasport, NY - Judy is and art educator in Medina NY and Pilgrimage attendee/leader for many years. She is an origami artist, stampin up demonstrator, and obsessed nature tangler! Mitchell Light - Gasport, NY – Mitchell is a sophomore at SUNY Cobleskill in Ag Business, 2 yr. Conservation Sanborn BOCES; Beaver Meadows, Iroquois Observations volunteer, Lake Plains Christmas Bird Count volunteer, Pilgrimage attendee since age 2; Salamander Walk leader since 2014. Judy Long - Jamestown, NY – Judy has attended the Pilgrimage each year since the 1970s with her family and friends from the Jamestown area. This experience has extended a sense of wonder and spirit of care for wildlife to her family and grandchildren. She has served on the Committee for the past 20-some years, in charge of the chicken barbecue and public relations. A teacher of young children with special needs, Judy incorporates nature in her teachings. She raised Monarch butterflies for several summers while teaching preschool, helping the children to collect eggs and milkweed on the school grounds and to feed the caterpillars and release them when they hatched as butterflies. She likes to think of herself of an avid birder and tries to learn more about birds every year. Bird-banding is a favorite activity. She helps raise Monarch butterflies for the Jamestown Audubon Society’s annual butterfly release day. A member and volunteer of Jamestown Audubon Society, Judy volunteers for several annual activities and feeds Liberty, the resident eagle, on Saturdays. Jeremy Martin - Friendship, NY - Jeremy has had an interest in nature for as long as he can remember. His patient mother tolerated pans of pond water in his bedroom and encouraged his early butterfly collections by making (and then frequently repairing) a butterfly net. While that early interest in ponds and entomology never became a career, Jeremy is lucky enough to now relive those early days of discovery with his two boys. Through photography he enjoys documenting nature all over western NY including wildflowers, dragonflies, moths and butterflies, and various other insects. He also participates in various citizen science projects including the New York Dragonfly and Damselfly survey where from 2005 to 2009 Jeremy volunteered as citizen scientist on discovering numerous county/species records in western New York. Samuel Martin – Friendship, NY – Sam is a 10 year old nature enthusiast who has been attending the Allegany Nature Pilgrimage since before he was born. Not content with helping his dad with dragonflies, he enjoys learning and teaching others about spiders. Lauren Makeyenko - Buffalo, NY - Lauren grew up in the village of Hamburg exploring natural areas around the Eighteen Mile Creek. She is the Director of Education for the Buffalo Audubon Society and previously held education positions with Tifft Nature Preserve and at Reinstein Woods Nature Preserve. In her free time, she enjoys venturing into the natural areas of Western NY with her family throughout the year. Andy Malicki – Red House, NY - Andy is ready and able to answer any question you may have about the Park's rich history. Specializing in the "How the Park got Started" Program, his passion is for Allegany State Park and he is knowledgeable in several areas from the late 1800s to the present time. Andy is also a park employee. Bill Michalek – West Falls, NY – Bill is a native of Western New York and has grown up learning the stories of the local flora and fauna. His explorations of the natural world have taken him to places as diverse as the Florida Everglades and the hills of Ireland. Starting his career as an environmental educator, he returned to school to earn his graduate degree in Education. He currently teaches second grade in the Iroquois School District, undergraduate environmental classes at UB, and runs the bird banding program for the Buffalo Audubon Society. He loves to share stories of the natural world and to hear them from anyone willing to share. Megan Mills Hoffman – Derby, NY – Megan grew up in southcentral Alaska, leaving the formal school classroom for an unstructured, informal, self-directed education from grades 5-12, returning to the classroom as a college student with a personalized transcript and admission to an out-of-state four year university honors program with a full tuition scholarship. She has since attended and worked in residence life, admissions, registrars, and development offices for two state universities, a state college, and a private university, completed a B.S. in Sociology, was a teacher’s assistant for college level social statistics, and built twenty years of experience working in development, fundraising, and community revitalization. While discovering Buffalo's many community treasures, she worked with BuffaloRising.com as it first expanded from a print publication to one of Buffalo’s most talked about online community news sources; the Burchfield Penney Art Center's New Museum Project, Buffalo’s first new museum for regional artists in 100 years; Verve Dance Studio; Buffalo State College; Western New York Land Conservancy; Young Audiences; and The Gow School. She has served on the boards of the Allentown Association, Field and Fork Network, and the Western New York Environmental Alliance. With twenty plus years of experience working in community development and grassroots organizations, she has embraced, developed, launched, and established, to varying degrees of success, a variety of local social movements, all directed at changing the way we think about our education and learning. She is the founder and organizer of Urban Creatives LLC, Learning Choices Network, and Pop Up Playdate Cafe; an organizer for Jness, a women’s social change organization; a behind-the-scenes advisor for Wonders of Eden, a Waldorf-inspired community cooperative; a longtime board member for Mandala School, Buffalo’s only independent, democratic, free school; and an Alternative Education Resources Organization (AERO) Representative. Chris Myers – Newark, DE – Chris is a Geologist working in Delaware. He is an avid amateur photographer and mineral collector. He has a number of digital cameras but enjoys shooting film. Chris has led both "Point and Shoot Photography Basics" and "Cell Phone Nature Photography" at the Pilgrimage. Chris takes pride in helping others understand the capabilities of their cell phone camera. 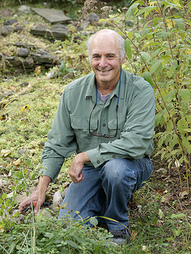 Lon Myers - West Chester, PA - Lon is an avid self-taught naturalist with a life long passion for nature. He has led walks at the Pilgrimage for 45 years including Beginning Birds, Sharing Nature with Children, Family Nature, The Splash Hike, Stream Adventure, Night Hike, and Adults Only. David O'Donnell - Clarence, NY - Growing up in rural upstate NY, David is a self-taught naturalist. Fortunate to be around open fields, streams and woods--he spent most of his childhood outdoors and became intimately connected to the natural world. The bond created came with a constant awareness of the changing environment, and now, the need to promote its recovery, conservation and protection. Through presentations, education, butterfly releases and native plant distribution, his Eastern Monarch Butterfly Farm aims to change the way we view our landscaping. Linda Ordiway – Bradford PA - Though pictured here with a frog, you will find Linda at the bird banding station. Dr. Ordiway is Mid-Atlantic/Appalachian Regional Biologist with the Ruffed Grouse Society. She has also worked as a wildlife biologist for the US Forest Service and has taught environmental and biological sciences at the University of Pittsburgh, Bradford PA.
Danielle Pecoraro - Blasdell, NY - Danielle has been feeding birds for over 35 years. She bought her mom her first birding field guide at the gift shop in Allegany in 1988. She is the owner of Wild Birds Unlimited in Blasdell, NY since 1997. She has a BA in Math and Economics from the University at Buffalo. Danielle is a Certified Backyard Birdfeeding Specialist. Dr. Allen Podet - Williamsville, NY - Ph.D. & DHL & DD, he has been leading field trips at Pilgrimage for 20 years. Dr. Podet learned about ferns through classes, clinics & experience. When not at Allegany State Park, Dr. Podet is a professor in the philosophy and humanities departments at Buffalo State College. ValerieJill Podet - Williamsville, NY - ValerieJill's day job is with the Lothlorien Therapeutic Riding Stables in East Aurora. She is affiliated with the NY Naval Militia, the US Navy League, the Lou Eibl Corral, the Buffalo Geological Society, Temple Hesed Abraham of Jamestown, Jewish Community Center of Greater Buffalo, Red Hats, Prairie Star Ranch, and NC Bectel Training Stables. Whew! And she still makes time to lead field trips at Allegany Nature Pilgrimage including beavers, general nature, animal signs, and the geology of the park. ValerieJill holds a Master’s degree in zoology and is almost (all but dissertation) a geologist. She has been leading field trips at Pilgrimage for 20+ years. Ellen Prill - Rochester, NY - Ellen is a retired ESL and reading teacher with experience in kayaking and canoeing on flat, moving and whitewater who currently owns 9 boats. She lives on Irondequoit Bay and has a lot of on-the-water experience. Ellen has led boating trips for the Genesee Valley ADK Club and on many informal trips with friends. Chuck Rosenburg - Elma, NY – Chuck has a B.S. degree in wildlife management from Purdue University and an M.S. degree in biology from the College of William and Mary. His master’s thesis focused on barn owl habitat use, as determined using radio-telemetry. For the first 15 years of his professional career, Chuck worked as a private environmental consultant completing a broad variety of ecological studies. Since 2006, he has served as a wetlands ecologist with the NYS Department of Environmental Conservation, where he also leads the NYS DEC’s winter raptor study in Region 9. Chuck is an avid birder and has led numerous Owl Prowls for Buffalo Audubon Society and other groups. Carolyn Ruth – Erie, PA – Carolyn is a graduate of Mercyhurst University. She is a Penn State Master Gardener and retired High School Chemistry teacher. Carolyn is politically active for electing good female candidates to public office. 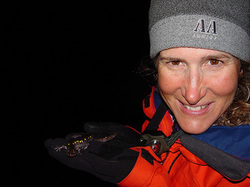 Heather Rutherford - Medina, NY - Heather earned her NC Environmental Education Certification and MEd in Science Education while teaching fourth and second grades in North Carolina. Back in NY, she is on a quest to become a better naturalist by learning from others and taking time to observe changes and animal behaviors through her photography. Harold Stock - Fairport, NY - Harold has attended the ANP for over 30 years. He has worked in three museums and is currently a docent at the Rochester Museum and Science Center. Garret Taylor – Salamanca, NY – Garret is a local chef who's been working at eating different wild mushrooms on his own for more than decade and is currently working on documenting what fungi and myxomycetes are in the park--focusing on when and habitat. Blair Tuttle - Erie, PA - Blair is a Professor of Physics whose research includes theoretical study of nano-materials. Liz Urbanski-Farrell – Buffalo, NY - Liz has been an avid birder since her first effort to put salt on a robin's tail as a toddler. Originally a journalist, writer and editor by training and trade, she holds a minor concentration in fine art from Buffalo State College and enjoys trying new ways of involving children and adults in art and the natural world, has participated in the Allegany Nature Pilgrimage with her family for 17 years. She has been a Cub Scout leader and is currently a member of the parent committee for Boy Scout Troop 5 and Sea Scout Ship 1 in Buffalo, NY and is director of member services and government relations for the Western New York Healthcare Association. Adele Wellman - Salamanca, NY - Adele is happiest in the woods--on skis, bike or on foot. She has a BS in Biology and minored in Horticulture at Tennessee Tech University. She is an environmental educator at Alllegany State Park where she leads numerous hikes for campers on topics ranging from beavers to bears, wildflowers and trees, to dragonflies and butterflies. Every season her students teach her something new about edibles and she enjoys sharing her knowledge with others. Her Master Gardener training through Cornell has served her well in current positions. David Wymer – Portville, NY - David has been involved in science and astronomy for over 30 years and has enjoyed the night sky from several dark sky areas. He has always enjoyed sharing the night sky with friends and family. He has done public nights at many locations through the years and has been at ANP for over 25 years. David did Astrophotography for many years, mainly at Cherry Springs State Park in PA and has had many photos published and used for newspapers, magazines and websites. These days, any excuse he can find to get to those "wild places" to simply enjoy the night sky and nature is priceless.